Why Did The Bears Give Up So Much For Mitch Trubisky? 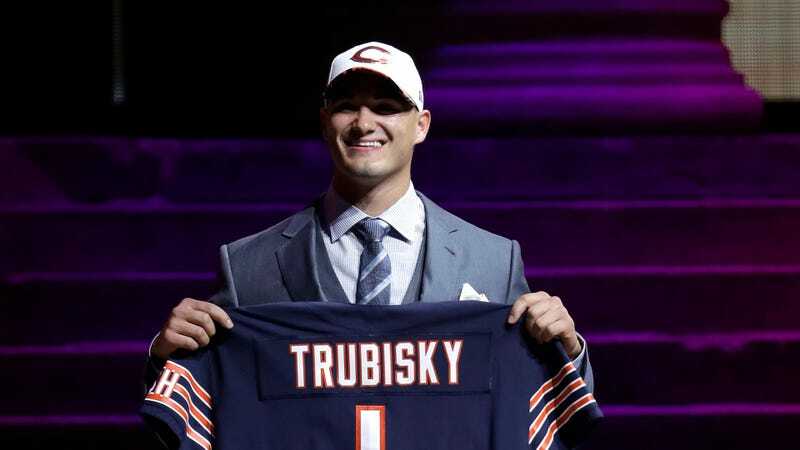 Nobody was more surprised at the Chicago Bears’ decision to send four draft picks to the San Francisco 49ers for the right to move up one spot and draft Mitch Trubisky than Trubisky himself. That’s because, according to Trubisky, the Bears only worked him out once, and never communicated with him in the weeks leading up to the draft. The Bears’ decision raises a few questions, the biggest being: Why the hell did they give up so much (picks 3, 67, 111, and a 2018 third-rounder) to move up one spot, and why were they suddenly so eager to draft a guy they never seemed all that interested in before? The answer to the first part of that question probably has a lot to do with the 49ers’ ability to convince the Bears that there was a big trade market for the No. 2 pick. Nobody expected the 49ers to take Trubisky, and so the only way to explain away the Bears’ decision to give up so much to get him is if they were certain that a handful of other teams were clamoring to make the same trade. Maybe that’s true! Or maybe the Bears got swindled. Either way, the second part of the question remains. Quarterback is obviously the most important position in football, but you would think that a team would want more than one workout’s worth of information on a prospect before paying such a hefty price to get him. Particularly in this draft, in which there didn’t seem to be any surefire franchise quarterbacks available, and in which Trubisky was the maybe biggest question mark of the bunch. The most generous way to read the Bears’ draft night is that they truly believe that Trubisky is a future stud and had always planned to do anything to get him. A less generous (and probably more realistic) reading of the situation is the Bears suffered a spasm of quarterback panic. They are probably already aware that a full season with Mike Glennon under center is going to be an ugly one, and perhaps the thought of heading into the 2018 draft with an even bigger hole at quarterback was just too much to bear. Now they can at least spend the year pointing at Trubisky on the bench, saying, “Look, we already have our future planned out! It’s all handled!” That’s a comforting thought right now, but at some point Trubisky will have to get on the field and actually be the player the Bears paid so much for.